The Promotion commences on Friday 25th January 2019 and ends on Thursday 28th March 2019. The Prize* is a two person cruise around New Zealand valued at $7,500.00 (Australian Dollars) including airfares (up to $1,000 per person) in the form of a voucher from Ackerfeld & Goldberg Travel Associates of 1/444 Glenhuntly Road, Elsternwick Melbourne Victoria 3185, Australia ABN is 25 003 377 188. The winners must use the voucher within 2 years of issue. A $2,000 allowance for airfares Flight dates and times are subject to availability at time of actual booking. The Cruise is with Celebrity X Cruises for 2 people valued at $5,500.00. The Cruise includes an unobstructed balcony cabin and all meals. Complete the entry form located at www.crampeze.com.au/nz including uploading a copy of the receipt of purchase of the participating product/s. 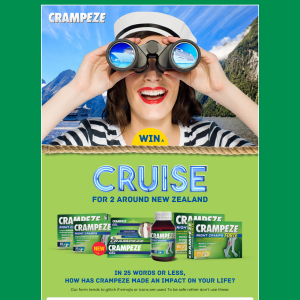 Or send an original copy of the receipt of purchase of the participating product, along with your answer to the question, to Crampeze Cruise Promotion, PO Box 630, Braeside, Victoria 3195. The winning entry, will be decided by the judges, on Friday 12th April 2019 at12.00pm at the Promoter’s offices located 120 Woodlands Drive, Braeside, VIC 3195. The winners’ first name and state will be posted on the company’s website www.crampeze.com.au.